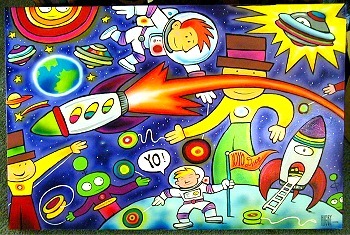 Early in 2004, I commissioned John Higby to paint this for my living room. I wanted a Space Theme, and John did the rest. Notice the mention of "yoyodave" in the painting. Painted for David Hall, "The Yo-Yo Collector", and owner of Skilltoys.com.